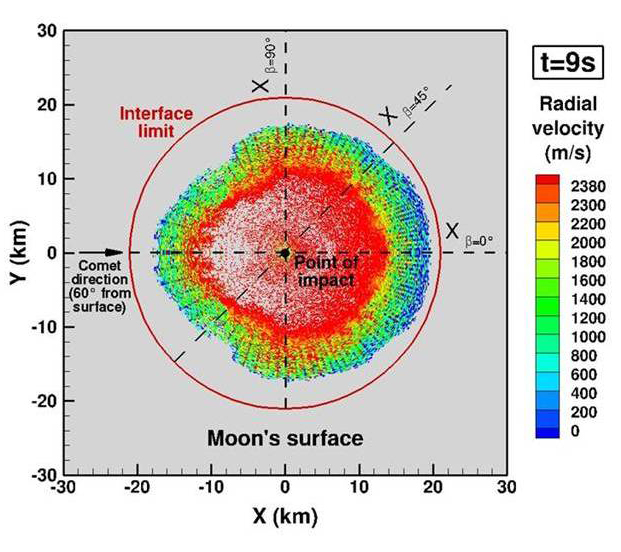 Mass density and radial velocity contours over the SOVA interface (a 20 km hemisphere centred at the point of impact) for two different oblique impacts. 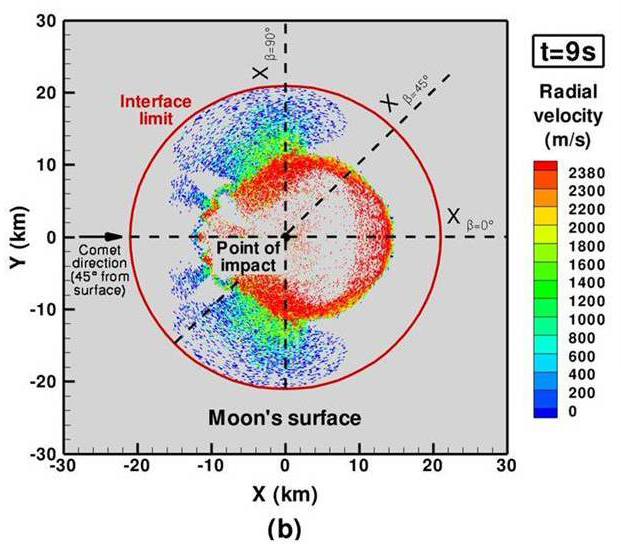 In the velocity contours, only material with velocity below lunar escape velocity (2380 m/s) is shown. 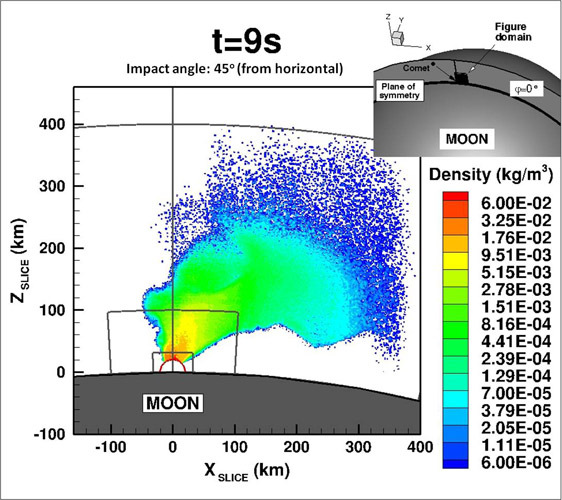 It can be seen that for the 60 degree (more vertical) impact, a larger fraction of the material crossing the interface is below escape velocity- thus more likely to be retained in a transient atmosphere and ultimately, deposited in cold traps. DSMC mass density contours for vapor plumes generated by two different oblique impacts. 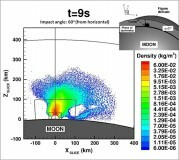 It is observed that there is less downrange focusing of vapor in the 60 degree impact, as well as lower velocities in the downrange and vertical directions. The red semi-circle indicates the hemispherical SOVA-DSMC interface (the SOVA hydrocode solves for the region within this boundary). Over the last four billion years, a large amount of cometary material is estimated to have impacted the Moon. Water ice is thought to be the major constituent of comet nuclei, and analysis of hydrogen isotopes present in lunar minerals suggests the possibility of a cometary source for lunar water. 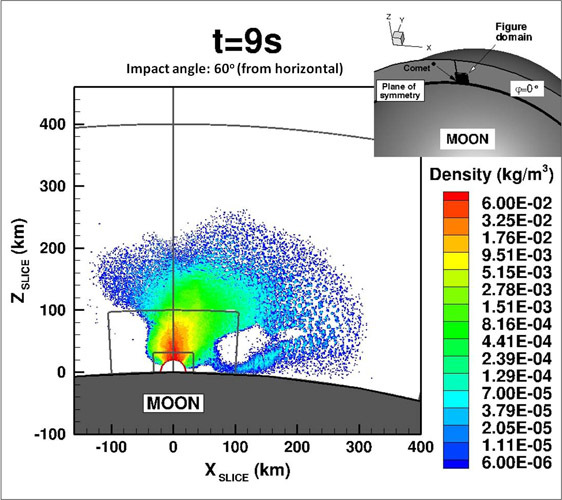 We simulate comet impacts on the Moon, with a view to studying the nature of deposition of cometary water in the Moon’s permanently shadowed craters (cold traps), where temperatures are low enough to trap water over geological time scales. 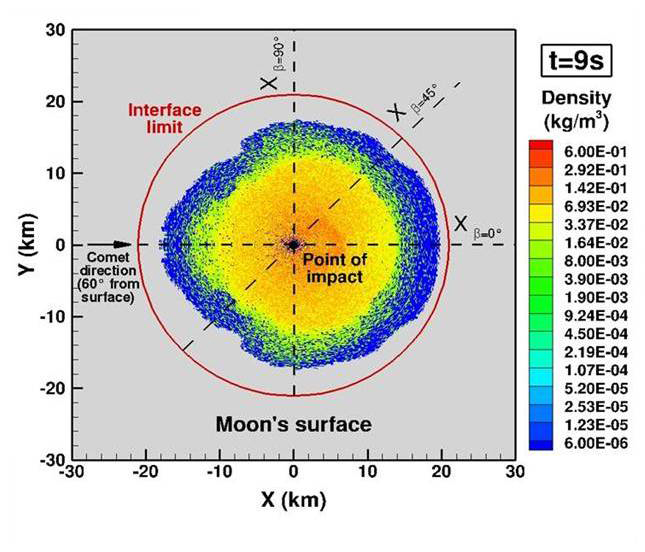 On impact, a comet vaporizes. 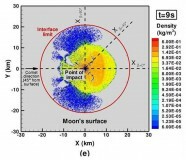 The dense regions closest to the point of impact are simulated by our collaborators at the Planetary Science Institute in Arizona, using the SOVA hydrocode. We then use a Direct Simulation Monte Carlo (DSMC) code designed to handle rarefied planetary scale flows to track the evolution of the water vapor plume, and the eventual deposition of water molecules in cold traps. We are currently carrying out a parametric study of the influence of various parameters (comet density, impact angle, velocity, location etc.) on the final deposition pattern. 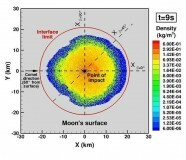 Our aim is to investigate whether cometary delivery can account for current observations of hydrogen on the Moon, and the influence of parameters such as impact angle, velocity and location on the extent and nature of final retention of water. 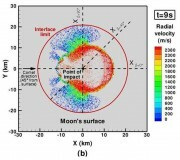 DSMC radial velocity contours for the first 30 s after the impact of a comet 2 km in radius, traveling at 30 km/s, impacting at an angle of 60 degrees from the horizontal. 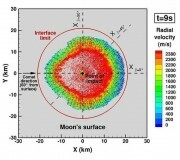 At this stage, vapor is largely traveling radially outward, most of it at velocities far above lunar escape velocity (2380 m/s). The asymmetry in the shape of the vapor plume is due to the oblique nature of the impact. The red semi-circle is the SOVA-DSMC interface and the dark gray lines denote successive DSMC computational domains. DSMC number density contours from 30 s to 40 minutes after impact, with streamlines. 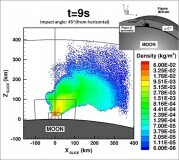 The development of the impact vapor plume into a transient atmosphere that surrounds the Moon can be observed. The white line marks material traveling at 2080 km/s (110% of the escape velocity 1000 km above the lunar surface). Vapor ‘above’ this boundary is certain to escape and is not considered in later-time simulations. 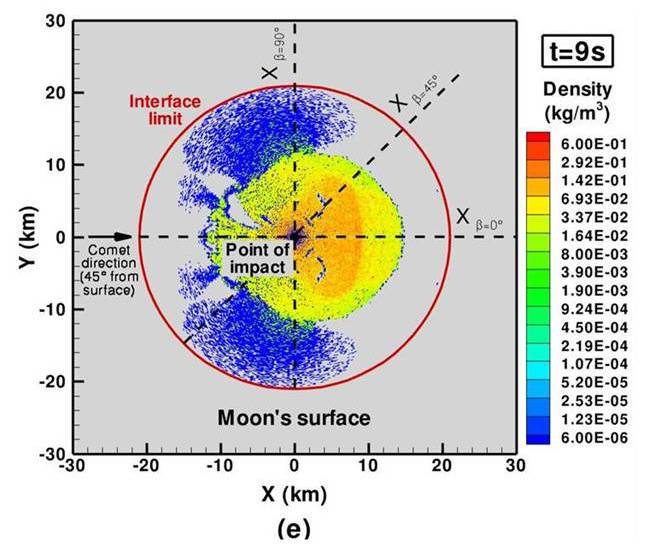 As the transient atmosphere develops, water begins to fall back to the surface of the Moon and migrates according to the temperature of the lunar surface.